Summer reading planning is well underway and CAMP HPLD 2017 will kick off on June 1. We are excited to offer fun programming on Tuesday mornings and Thursday evenings. We will also have movies on Friday mornings, and the Ecology Action Center will be here on a Friday morning as well. We will wrap up the summer reading programming at a CornBelters game with a date to-be-announced soon with our children completing reading logs receiving free tickets for this game. The First State Bank of Bloomington is sponsoring our end of the summer program with The Normal Storyteller, Dr. Mike Lockett on July 27 at 6:00 p.m. to be held at the library. Make plans to join us by visiting our website to note dates and times of all our programming this summer! We are still in need of many volunteers to make our summer reading camps happen. If you are interested, stop by the library for a volunteer application or visit our website at heyworthlibrary.com to download a volunteer application today. Do you have a collection you would be willing to share with the library to loan to us for display? We are seeking collections to display for a month at a time for the rest of the 2017 year. Stop in or give a call if you would be willing to loan the library your collection. We have had rubber duckies, antique toys, pottery, and would love to show off your treasures. We are sad to announce our departure from Freegal for downloadable music for our customers. We can still obtain any music you may want through interlibrary loan from around the state of Illinois. Please ask a librarian if you have questions on how to receive your favorite music at the library. New CDs will be purchased for our collection each month beginning in May. Need a cake pan? We now have 130 cake pans to loan out free of charge for 7 days. All have been donated to the library. All you need is a library card! 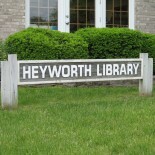 Cards are free if you live in the Heyworth Public Library District. Stop in to find out if you live in the district to get your free library card or visit our website to look at our district map. Then access all the books, audiobooks, magazines, eBooks, and cake pans to your heart’s content! We are a part of 200+ other libraries and can obtain books and other materials from all over the state free to ship to us. We honor Bloomington Public Library, Normal Public Library, Vespasian Public Library, and many more library’s cards as well. Our cardholders can also visit these other libraries if they choose as well. That is why we say: We are so much larger than our walls! April 28 After School Movies, 3:20 p.m. every Friday the library is open during the school year. Bring a friend and your own snack! All drinks need to have a screw on cap – no juice pouches or cans please. May 11 The library will be open 10 a.m. – 5 p.m. and close at 5 p.m. for Hey Days evening events held in the village parking lot. May 13 The library will be closed. May 1 and 15 Heyworth Knitters and Crafters, 1st and 3rd Mondays of each month, 6:30 p.m. – 7:30 p.m. This group is very willing to teach anyone who would like to learn to knit. We have yarn, instructions for beginning projects, and needles to get you started on a new hobby. If you want to learn how to knit, you must sign up to attend, so the knitters can have all you need ready for the evening. If you are a knitter or a crafter, looking to socialize with others in our area, just show up as your schedule allows. Available to anyone 4th grade and up. This group is providing projects to the local Project Linus chapter. May 16 Little Bricks & Big Ideas, the last program of this school year – 3rd Tuesday of month at 3:30 p.m. Lego building, afterschool snack, and games. Sign up at the library. K – 8th grade. May 24 Senior Information & Assistance, 10 a.m. – Noon. The trained staff of Community Care Systems, Inc. will be here to assist people over the age of 60 and the disabled with filing for local, state, and federal programs. Their next visit will be June 28. May 29 The library will be closed for the Memorial Day Holiday. This entry was posted on April 26, 2017 by Heyworth Public Library District.